"That Squeezing Feeling: The Interest Burden and Public Debt Stabilization". Xavier Debrun and Tidiane Kinda; WP No. 13/125. "The Anatomy of the VAT", Michael Keen; WP No. 13/111. "The Challenge of Debt Reduction during Fiscal Consolidation", Luc Eyraud and Anke Weber; WP No. 13/67. "The Impact of Debt Sustainability and the Level of Debt on Emerging Markets, Spreads", Nazim Belhocine and Salvatore Dell'Erba; WP No. 13/93. "The Fiscal and Welfare Impacts of Reforming Fuel Subsidies in India", Rahul Anand, David Coady; Adil Mohommad; Vimal Thakoor; and James Walsh. WP No. 13/128. "Taxing Immovable Property Revenue Potential and Implementation Challenges", John Norregaard, WP No. 13/129. “Green Tax Design in the Real (Second-Best) World” by Ian Parry. Encyclopedia of Energy, Natural Resource, and Environmental Economics 3, 161-168, 2013. “Size, Spillovers, and Soft Budget Constraints,” Ernesto Crivelli and Klaas Staal, International Tax and Public Finance, Vol. 20, Issue 2, 338-356. "Prudent or Profligate", Paolo Mauro, Rafael Romeu, Ariel Binder, and Asad Zaman, Finance & Development, June 2013, Vol. 50, No. 2. During the period of February 2012-May 2013, FAD provided 78 technical assistance missions from headquarters to IMF member countries and multi-country organizations. FAD seeks talented professionals with a background in public finance, to work on macro-fiscal policy issues and to provide technical assistance advice to IMF member countries on PFM, tax reform, revenue administration, and different expenditure policy issues. Vacancies in FAD for staff and long-term expert positions are posted here. FAD also seeks experts who are interested in occasional short-term (2–3 week) assignments. Interested candidates may send their CVs here. For new readers who would like to subscribe to the newsletter, send an email to FAD Subscribe. Fiscal Monitor - Short Term Risks Have Declined, but Global Prospects Remain Subdued. The latest Fiscal Monitor takes a fresh look at the policy challenges facing advanced and emerging economies. Short-term fiscal risks have declined over the past year thanks to continued progress in reducing advanced economy deficits and a gradually improving external environment. However, global prospects are subdued, and debt ratios still remain high in many advanced economies. Further fiscal consolidation efforts are thus in store for several advanced economies, as well as for some emerging economies. On March 27, Mr. Lipton (IMF First Deputy Managing Director) launched a paper on energy subsidy reform at the Peterson Institute in Washington DC. The paper, authored by FAD, as well as the African and Middle East Departments, provides the most comprehensive estimates of energy subsidies currently available for 176 countries. It also analyzes “how to do” energy subsidy reform, drawing on insights from 22 country case studies. The paper, which was published in English, French, and Arabic, has attracted significant press attention around the world, including the Financial Times, the New York Times, the Wall Street Journal and National Public Radio. FAD organized a seminar on Fiscal Transparency on April 15, which was opened by Min Zhu (IMF Deputy Managing Director). Experts from governments, academia, and civil society discussed how to revitalize the transparency agenda in the wake of the recent crisis. In collaboration with the Statistics Department, FAD has drafted a new Fiscal Transparency Code that focuses on the quality and reliability of fiscal reports. It will be released for public consultation on June 17. 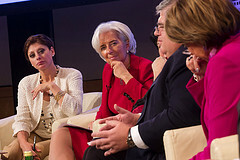 The “Evolving Role of Fiscal Policy” was the theme for the Fourth IMF Fiscal Forum held in Washington DC on April 18th. Forum sessions discussed the key macro-fiscal challenges facing policy makers and the role of fiscal policy in promoting equitable and inclusive growth. 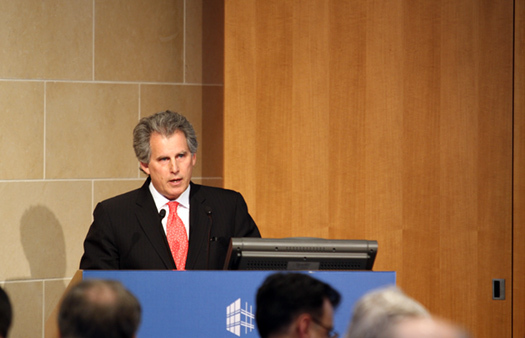 The event was opened by David Lipton (IMF First Deputy Managing Director). Keynote speakers included Laura Tyson, Brad DeLong, François Bourguignon and Robert Barro. The event concluded with a high level panel moderated by Maria Bartiromo (Anchor, MSNBC). Panelists included Christine Lagarde (IMF Managing Director), Sharan Burrow (General Secretary, ITUC); Agustín Carstens (Governor, Bank of Mexico); Laura Tyson (Professor, UC Berkeley); and Axel Weber (Chairman, UBS). On April 21, IMF Managing Director Christine Lagarde and World Bank President Jim Yong Kim opened a conference in Washington DC on “Fiscal Policy, Equity and Long-Term Growth in Developing Countries”. The event was attended by more than 250 senior policymakers, academics, and representatives from donors and NGOs. 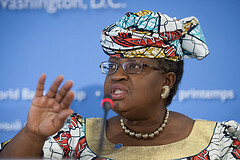 Ngozi Okonjo-Iweala - the Finance Minister of Nigeria - delivered the keynote speech during lunch. The event concluded with an energetic panel discussion moderated by Scott Morris (Centre for Global Development). The panel included Finance Minister Maria Kiwanuka (Uganda); Governor Benno Ndulu (Tanzania); Vice President Otaviano Canuto (WB); and Professor Ravi Kanbur (Cornell University). The Japanese government has agreed to continue its financial support for FAD’s technical assistance (TA) in South East Europe. Japan has been instrumental in funding key FAD assistance efforts around the world for more than a decade. Its financial support for South Eastern Europe has helped to advance priority reforms in the region. These reforms have strengthened fiscal controls, improved the allocation of budgetary resources, and developed more efficient revenue administrations. 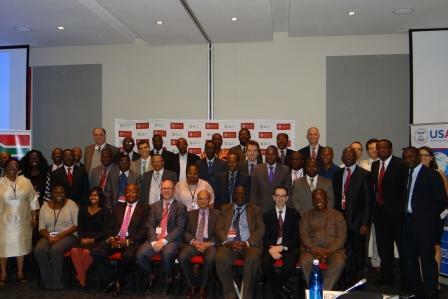 Senior African policymakers from sub-Saharan countries came together on March 14-15 in Johannesburg for the Second African Fiscal Forum. Participants discussed fiscal risks facing the region and how to generate additional fiscal space to achieve development objectives. The discussion also covered the high fiscal cost of tax exemptions and energy subsidies. The event was jointly organized by the IMF’s African and Fiscal Affairs Departments in collaboration with the National Treasury of South Africa. 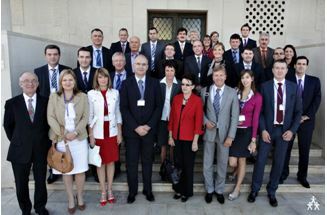 FAD and the European Department brought together leading experts and over 40 government officials for a conference on pension issues in Emerging Europe. The conference - held on March 18 2013 at the Joint Vienna Institute - discussed how countries could address pension challenges in a fiscally sustainable and equitable manner. The conference discussed the fiscal implications of demographic change, managing the transition costs from unfunded to funded pensions systems and ensuring adequate retirement incomes. On March 13, the IMF organized a one-day workshop in Paris on “The Functions and Impact of Fiscal Councils”. Independent Fiscal Councils are institutions that are funded by the government but provide independent advice on fiscal issues. Fiscal Councils often operate within the context of existing fiscal rules, and are seen as a mechanism to promote compliance. Invited speakers included Carlo Cottarelli (Director, FAD); Lars Jonung (Chairman, Swedish Fiscal Policy Council); Daniele Franco (Managing Director for Research, Banca d’Italia); and Sebastian Barnes (Irish Fiscal Advisory Council). "Debt and Growth: Reinhart-Rogoff Reprise" -The Economist. "The IMF, the AAA and all that" BBC. "Austerity Europe" - New York Times. "Stop the Fossil Fuel Subsidies", Washington Post. "Study Challenges Fuel Subsidies", New York Times"
"IMF Cites Hidden Price of Energy Subsidies", Wall Street Journal. "IMF Signals Push to Scrap Energy Subsidies", Financial Times. "IMF Says Washington Cutting Budget Deficits Too Quickly", Reuters. "High Public Debt Raises Fiscal Crisis Risk", Xinhua. "IMF Sees Progress on Deficit Reduction" - Financial Times. 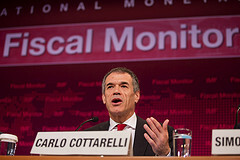 "The Fiscal Milestone: Achievements, Fatigue, and Prospects" Carlo Cottarelli, Huffington Post. 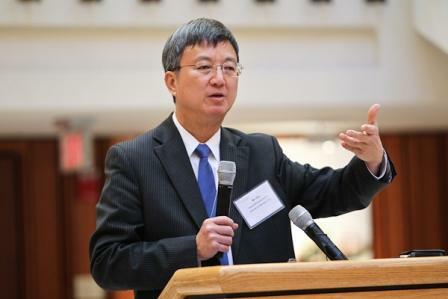 "Revitalizing the Fiscal Transparency Agenda", Min Zhu, Deputy Managing Director, IMF, PFM Blog. "Subsidizing Energy Consumption: Why it’s Wrong and What Can Be Done About it" Carlo Cottarelli, iMFdirect. "Mountains of Debt: the Cliffs, Slopes and Uncharted Territories of Today’s Public Finances in Advanced Economies" Presentation by Carlo Cottarelli, Boston College. "From Here to Eternity: The Outlook for Fiscal Adjustment in Advanced Economies", Carlo Cottarelli, Peterson Institute for International Economics (presentation). Fiscal Adjustment in an Uncertain World. Interview with Carlo Cottarelli, Director of the Fiscal Affairs Department. David Lipton's Opening Remarks at Fiscal Forum: The Evolving Role of Fiscal Policy. Fiscal Forum: Lunch Keynote Speech from Robert Barro. Fiscal Forum: The Evolving Role of Fiscal Policy. Revitalizing the Fiscal Transparency Agenda. Q and A with Carlo Cottarelli: Fiscal Adjustment in Advanced Economies, Peterson Institute. Public Financial Management and Its Emerging Architecture.